Materials: Sport weight yarn in colors MC and CC: one 5-oz. ball of each color. (Model knitted with Loops and Threads Snuggly Wuggly yarn); size 3 and 6 knitting needles, cable needle. Size: 3 (6. 12) months. Gauge: 5 1/2 sts/inch on larger needles in stockinette stitch. Sweater Front: With size 3 knitting needles, cast on 7(9,11) sts with MC, 6 sts in CC, 25 sts in MC, 6 sts in CC, and 7(9,11) sts in MC. 51(55,59) sts. Row 1: with MC; k1, (p1, k1) 3(4,5) times; with CC, p1, k4, p1, with MC k25; with CC, p1, k4, p1; with MC, k1 (p1, k1) 3(4,5) times. Row 2: with MC, p1, (k1, p1) 3(4,5) times; with CC, k1, p4, k1, with MC, p25; with CC, k1, p4, k1; with MC, p1, (kl, p1) 3(4,5) times. Row 3: with MC; k1, (p1, k1) 3(4,5) times; with CC, p1, sl 2 sts to cable needle and hold in back, k2, then k2 from cable needle, p1, with MC k25; with CC, p1, sl 2 sts to cable needle and hold in back, k2, then k2 from cable needle, p1; with MC, k1 (p1, k1) 3(4,5) times. Rows 7-12: Repeat rows 1-6. Row 13: Change to larger needles, and with MC, knit into front and back of first st, k5(7,9) knit into front and back of next st; with CC, p1, k4, p1; with MC, k3, M1, k10, M1, k9, M1, k3; with CC, p1, k4, p1; with MC, knit into front and back of fist st, k5(7,9), increase in last st. 58(62,66 sts). Row 14: With MC, p9(11,13); with CC, k1, p4, k1; with MC, p 28; with CC, k1, p4, k1; with MC, p9(11,13). Keeping in pattern as set, work MC in st st, and cross the cable in CC on next and every 6th row for 2(4,4) more rows. Right side will be facing for next row. Work sailboat chart between cables in MC, while keeping in set pattern for cables and sides. When sailboat chart is complete, work even until piece measures 8(8 ¾, 9 ½) inches. Row 1: Keeping in pattern, work across 27(29,31) sts, k2tog. Turn. (Leave rem sts on needle to be worked later). Row 2: Patt to end. Row 3: work across 26(28,30) sts, k2 tog. Turn. Row 7: Work across 25(27,29) sts, k2 tog. Turn. Row 11(Do not work rows 11,12 and 13 for smallest size. Skip to row 14): Work across 0(26,28) sts, k2 tog. Turn. Row 14: Bind off 3(4,4) sts at neck edge. Work to end. Decrease 1 st at neck edge on next 1(3,3) rows. Row 1:Attach yarn to sts left on needle; Ssk, patt to end. Row 3: Ssk, patt to end. Row 7: Ssk, patt to end. Row 11(Do not work rows 11,12 and 13 for smallest size. Skip to row 14): Ssk, patt to end. Row 13: Bind off 3(4,4) sts at neck edge. Patt to end. Work same as Sweater Front, omitting sailboat and neck shaping. Work even until Back measures same as Front. With size 3 knitting needles, cast on 11(13,15) sts with MC, 6 sts in CC, and 11(13,15) sts in MC. Work ribbing and cable same as Front over 12 rows. Inc 4 sts evenly on next row in MC (36 sts). Keeping in set patt, inc 1 st each side of sleeve every 5(5,6) rows until 44(54,56) sts are on needle. Work even until sleeve measures 5 ½ (8 ½, 9 ½) inches. Bind off 15(20,21) sts at beg of next 2 rows. Work rem sts in Patt for 3(3 ½,4) inches. Sew saddle shoulder of sleeves to shoulders. Sew sleeves onto fronts and back. Sew side seams. 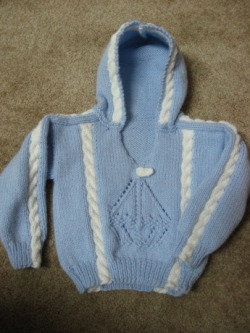 Hood: Pick up 8(10,10) sts across Right Front neck (not the V), 12 sts across saddle of sleeve, 21(23,25) sts across the Back, 12 sts across saddle of sleeve, and 10 sts across Left Front (67 sts). Knit 3 rows, increasing 1 st at each neck front and 1 st at center back on last row (70 sts). 2 sts in garter stitch with MC, 6 sts cable with CC, 54 sts st st with MC, 6 sts cable with CC, and 2 sts garter stitch with MC. Work even in Patt for 6(7,7 ½) inches. Row 1: Work across 33 sts in patt; k2 tog, ssk, patt to end. Row 3: Work across 32 sts, k2 tog, ssk, patt to end. Row 5: Work across 31 sts, k2 tog, ssk, patt to end. Row 6: Patt across 30 sts, p2 tog-b, p2 tog, patt to end. Row 7: Patt across 27 sts, (k2 tog)twice, (ssk) twice, patt to end. Row 8: Patt across 26 sts, (p2 tog-b) twice, (p2 tog) twice, patt to end. Flag: With CC and larger needles, cast on 6 sts. Bind off loosely. Sew to top mast of boat. Graph created by Knit Design Studio.